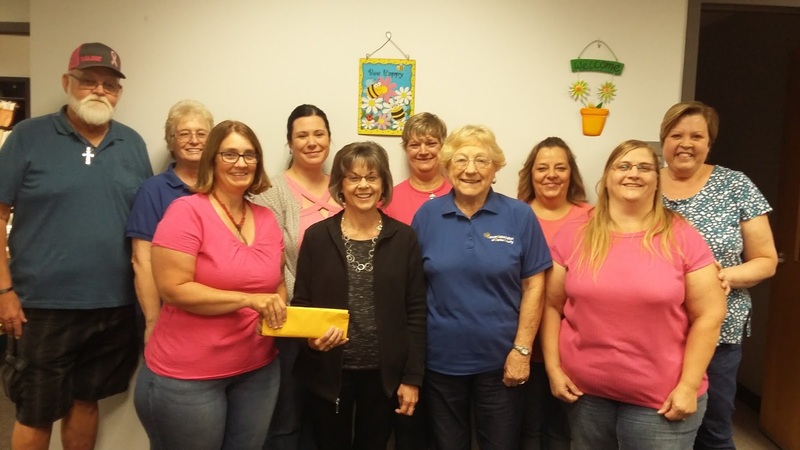 “On behalf of the Darke County Job and Family Services staff, we would like to offer this donation in memory of our colleague and dear friend, Linda Malott. She blessed each of our lives and we are amazed at the support and assistance she received through the Cancer Association of Darke County. Our hope is that her memory lives on in the help this gift may give other fighters and their families. Cancer Association of Darke County exists to help local cancer patients in their difficult battle. Anyone living in Darke County who has cancer can receive “no strings attached” benefits. The benefit lasts for 5 years and the belief of the organization to try to find a reason to pay, not to not pay, for benefits. The organization is funded by local grants, United Way and many generous people who donate generously to help their neighbor. The organization is not affiliated with American Cancer Society or any other cancer group. Volunteers are always needed to help with driving and fundraising. For questions call Christine at 548-9960.